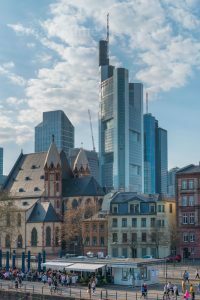 On Saturday I visited Frankfurt. I took the regional train from Wiesbaden, where we stayed overnight, to Frankfurt. From Frankfurt Hauptbahnhof I walked via the Willy Brandt Platz to the famous Eiserner Steg, an iron bridge for pedestrians, crossing the river Main. From there you can see on the one side the Church of the Three Kings and on the other side the mixture of high-rise office buildings next to the old city center. Then I walked to Römerberg (Roman Mountain), the Town Hall square. Here you see all the old buildings. This square being the center dates back to the Middle Ages. The place was crowded, so it was not easy to take nice pictures. Below some impressions. 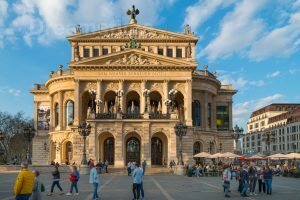 The next stop, before going back to the train station, was the Alte Oper, the former opera building, which is now used as music hall. As you can see, people were really enjoying the perfect weather. 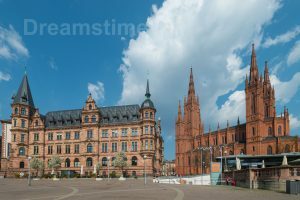 Here you can see all the pictures of Frankfurt accepted by Dreamstime. 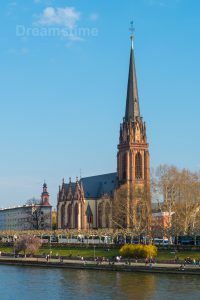 On Sunday I made a tour through Wiesbaden. Via a park with a small pond in the river Salzbach I went to the Marktkirche and the Neue Rathaus. 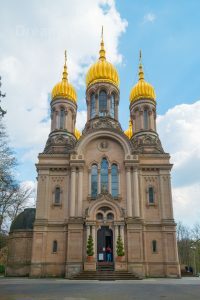 From there I walked, via Kochbrunnenplatz (above Cafe del Sol with the nice tree), all the way up to the Russian-Orthodox Church on the Neroberg. This was quite a climb. It is one of the oldest Russian-Orthodox churches in West-Europe with its typical architecture with golden onion-shaped domes. On the way back I passed the Saint Bonifatius church at the Luisenplatz. Walking through Wiesbaden was quite enjoyable, all the nice houses, churches, buildings. You can see the richness of the city everywhere. 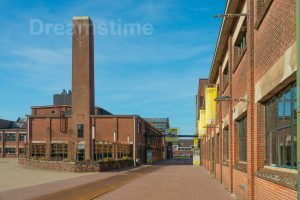 In most cases I used my 16-35mm lens and used the correction perspective Upright of Lightroom to avoid “diagonal buildings”. 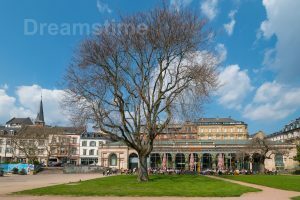 Here you can see all the pictures of Wiesbaden accepted by Dreamstime. 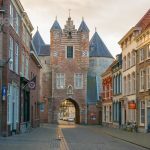 For a sad reason —the cremation of an aunt of mine— we traveled to Bergen op Zoom, the city of birth of my parents. At the same time it was nice to see the family again. To avoid early morning traffic jam we made the trip the day before. We stayed in Hotel Old Dutch in Bergen op Zoom, which is near the railway station. 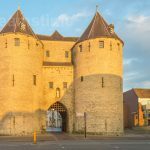 Last time we visited Bergen op Zoom, which was about a year ago, I only took pictures of Fortress De Roovere and none of the city center. So, we decided to stroll around a bit before having dinner. We left the hotel at a quarter to 6, all the shops were closed, there was hardly anybody in the streets and the sun was about to set. The clouds in the sky were turning warm yellow/gold and the buildings had a nice warm colour. 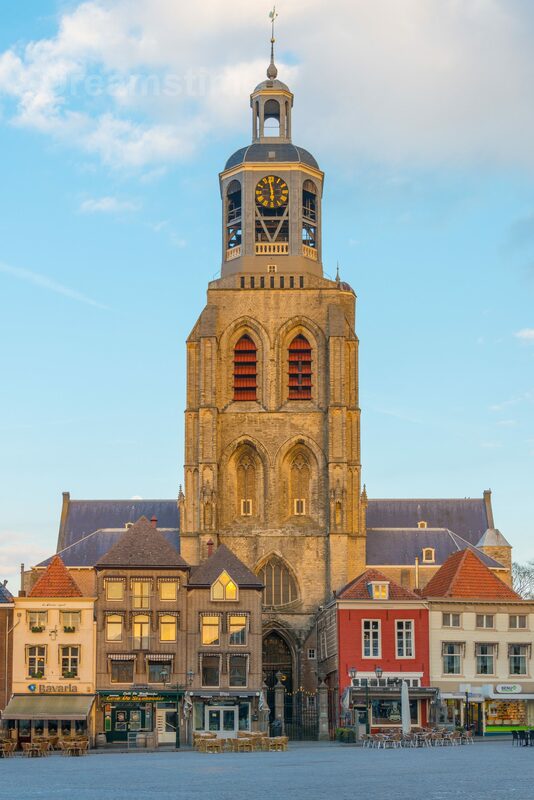 At the main square, called Grote Markt, there is a really large church called St Gertrudiskerk. Walking through the Stationsstraat, the Wouwsestraat, and the Zuivelstraat we were heading for the Grote Markt. On the way we got a first glimpse of the church. Notice the colour of the sky. The Grote Markt was completely deserted so it was quite easy to take pictures from all sides of the square. Then we continued in the direction of the Gevangenpoort, where I took pictures from both the Lievevrouwestraat and the Rijkebuurtstraat (my mother was born and raised there). On the way back we visited the Markiezenhof, a city palace dating back to 1485. Here I missed my 16-35mm lens, I had only taken my 28-300mm lens. Therefore, I could not take a picture of the whole facade at once. Also, there were many cars in front of the building. So, I only shot the tower. A good reason to come back to the Markiezenhof again and get a tour with an official guide, which turns out to be a member of the family! 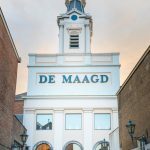 Just before going for dinner at Restorante Napoli I took the picture below, where you can see the top of the tower of De Maagd. 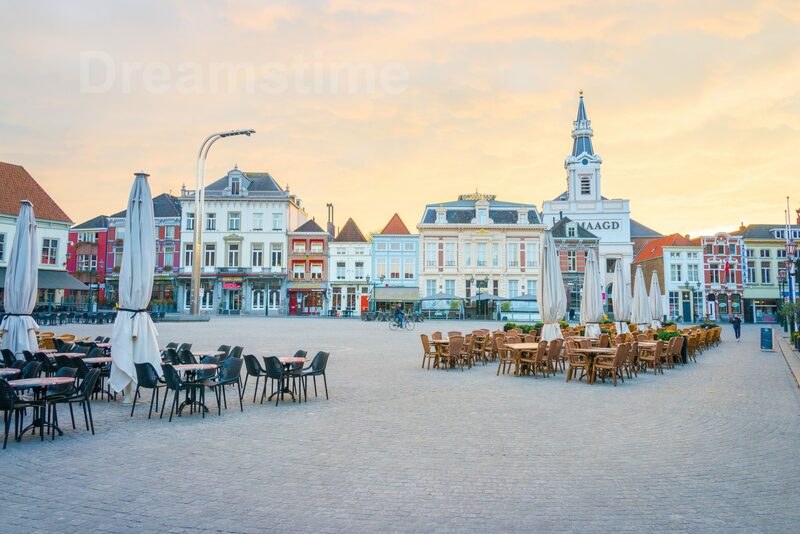 All 11 pictures of Bergen op Zoom I submitted to Dreamstime were accepted, resulting in a total of 750+ pictures at Dreamstime. 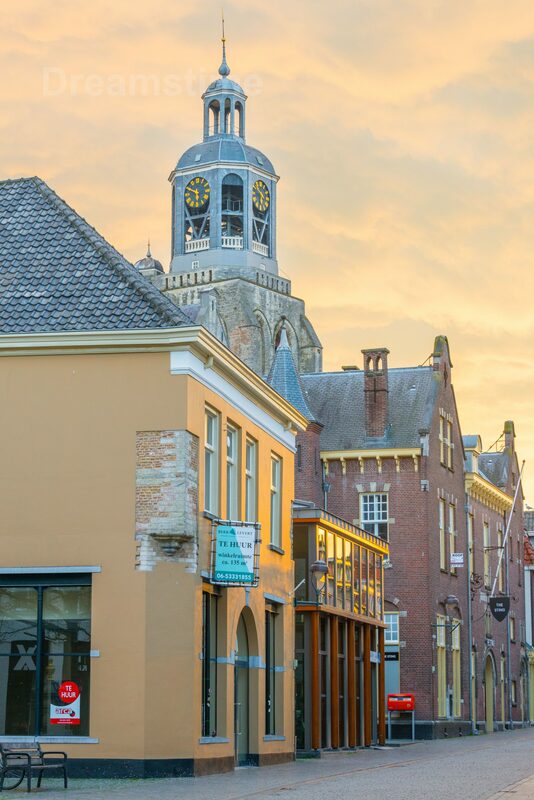 When coming from the west heading home — either by car or train — I everytime enjoy the beauty of the skyline of Deventer. 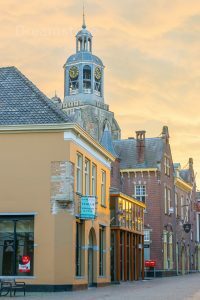 Last week I decided to take the train to Deventer for a walk through the old city and, of course, to take pictures. 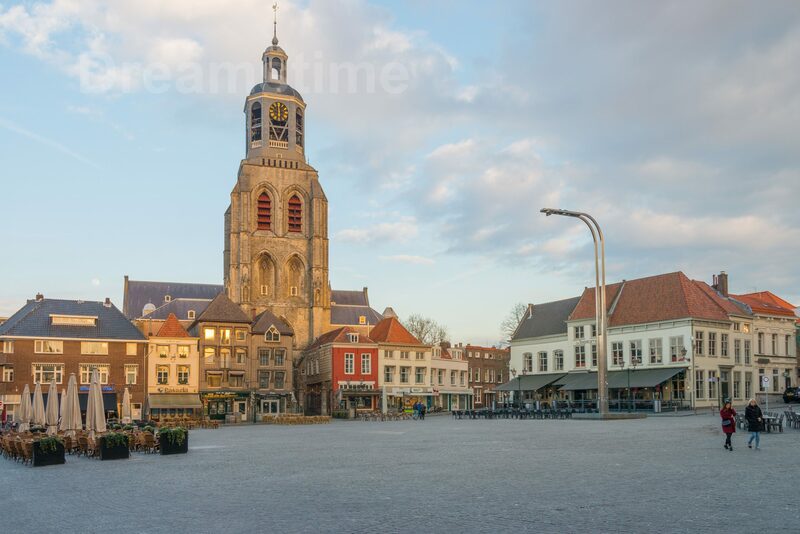 From the railway station I walked past the theater to the Brink, the main square of Deventer, a former Hanseatic city. Already on the way I saw some very nice buildings. The Brink was overwhelming. It was a nice sunny day around lunch time. All the terraces in the sun were crowded with people enjoying the early spring sun. I had selected the Bergkwartier en Brink audio tour on the izi.TRAVEL app to guide me in about an hour through the old city. It started at the Brink. The first picture I wanted to take was of the Waag, a very prominent building on the Brink, however, there were all kinds of trucks parked right in front of it. So, I skipped that. To be honest, this happened to me several times during this trip: always cars parked right in front of the most beautiful houses or churches. Still, I took some nice picture to grap the beauty of the old center. As you can see, all these houses date back quite a long time. It was really interesting to hear about the individual history of these houses. 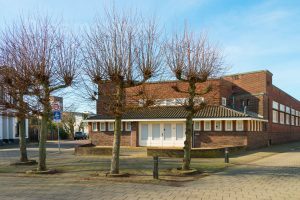 For example, De Golden Vijzel used to be a farmacy. 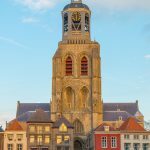 The next stop was the Saint Nicolas church, also called Bergkerk, with the two towers. Currently, it is used as exhibition center. 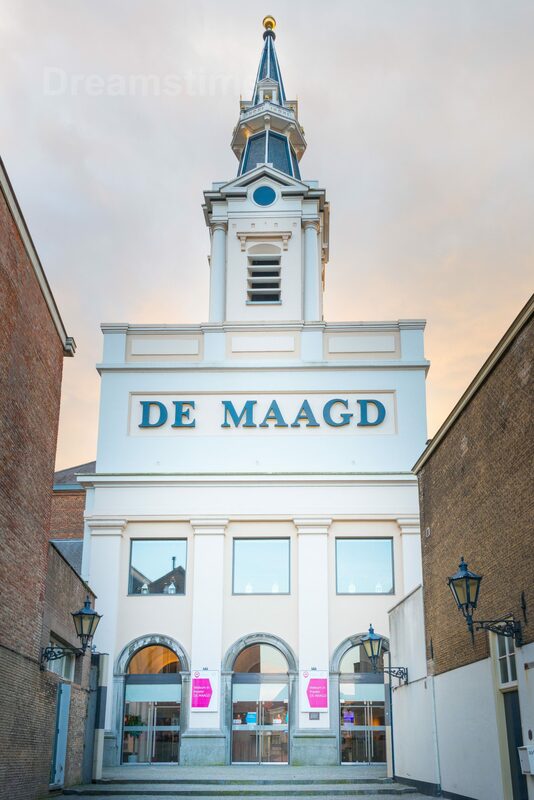 Below two pictures of the Bergkerk: one on the outside and one on the inside. Until quite recently there were still stables for horses in the center of Deventer. At Roggestraat 8 you can see one of these former stables. After finishing the tour I decided to go to the other side of the river IJssel to take pictures of the quay of Deventer. So, I crossed the Wilhelmina bridge and walked north to the ferry stop to take the ferry back to Deventer. However, the sunny terrace of the Sandton IJsselhotel was quite inviting to have lunch. 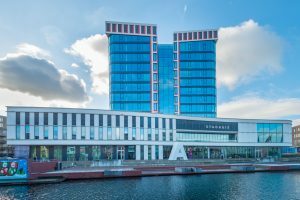 The pictures below (all accepted by Dreamstime) were taken from the bridge, the Uiterwaarden, the hotel (during lunch), and the ferry. 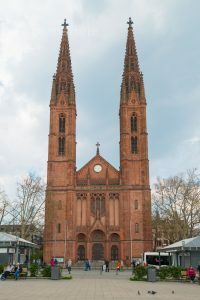 After lunch I returned by ferry to the center to visit the Lebuinus church from close by. 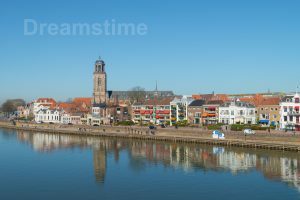 Here you will find all the pictures of Deventer accepted by Dreamstime. 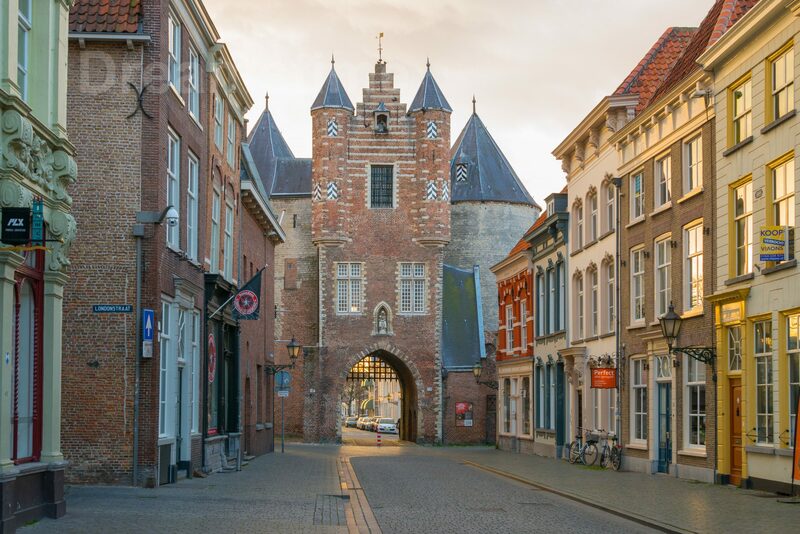 Below you see my route through the old center of Deventer. As you can see the reception of the GPS on my iPhone X was not always strong enough. In the past Hengelo was mainly known for his metal industry. In the second half of the nineteenth century Charles Theodorus Stork started a plant to build machines in Hengelo. C.T. Stork, together with his sons, took the initiative to plan and to build the district Tuindorp ‘t Lansink —named after the farm ‘t Lansink— for the personnel of the Stork factorry. The idea of C.T. Stork was to provide adequate housing and teaching, for his personnel and their families. 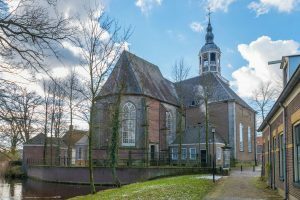 Tuindorp was set up in such a way that would provide a good mix of houses for all personnel of Stork. The sons of C.T. Stork implemented his ideas —with the help of architect Karel Muller— in the first half of the twentieth century. Also personal development was regarded important, therefore they built, among other things, a school, a public library, and a kindergarten. In a way they were their time far ahead. From a photographic point of view this district gives a nice mixture of old industrial buildings and well-kept houses. So, it was time for me to explore my home city. 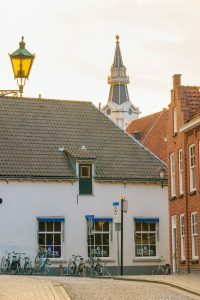 I used the WandeleninOverijssel app to guide me from the center of Hengelo and along the interesting places in Tuindorp. 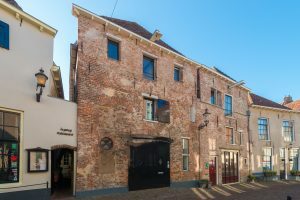 The first stop was at the intersection of the Vondelstraat and the Jacob Catsstraat, where the former library of Hengelo was located. Anton Karel Beudt was the architect. Because of an argument between Stork and the city it was located outside Tuindorp. The second stop is at the Hazemeijer Hengelo (HH) complex between the two railway tracks from Hengelo to Almelo and from Hengelo to Zutphen. It is a beautiful industrial heritage of the Holec factory, which is now mainly used by creative industry companies. The third stop is at the C.T. Storkplein, for me one of the most beautiful squares in Tuindorp and in Hengelo. I come here every now and then to have dinner at Hotel ‘t Lansink, a Michelin star restaurant. Especially during summer, it is nice to have a late-night dinner on the balcony, overlooking the square. From there on I walked along the small pond called the Tuindorpbad. The pond originated to obtain the necessary sand for the construction of the houses. Part of the pond is still a public swimming pool —also founded by Stork—, with water of excellent quality due to an underground spring. The buildings of the swimming pool are part of the cultural heritage of Tuindorp. I come here every week for my yoga classes and always enjoy the view. 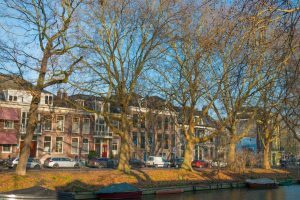 The area around the Tuindorpbad is really magnificent: the pond, the eminent trees, and the houses; a peaceful place to be. 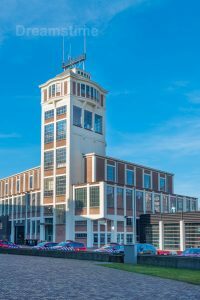 From there, via De Gieterij (now the ROC School of Twente), the Water Tower of Stork, the HEIM museum located in the former factory school for Stork personnel, back to the center of Hengelo. I actually visited Tuindorp several times. During these occasions I used the 16-35mm and the 28-300mm lenses. For the pictures taken with the wide-angle lens I corrected the perspective correction Upright of Lightroom to obtain vertical lines for the walls of buildings. Below you see the original route. A couple of days later I took pictures of the Verenigingsgebouw Stork, which is part of the cultural heritage of C.T. Stork. 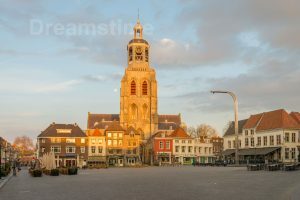 Here you see all my pictures of Hengelo accepted by Dreamstime (larger and better quality). 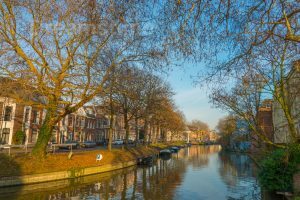 Recently we visited friends in Utrecht, close to the northern part of the Stadsbuitensingel, a canal almost completely surrounding the center of Utrecht. Popular walking tours never took me to this neighborhood. So, I decided to come back another day during daytime and with my camera. 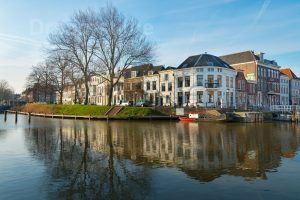 I travelled to Utrecht the day before I had to chair a day-long meeting. So, I took my Peak Design Travel Backpack 45L to carry my clothes (in a medium packing cube), wash pouch, my camera plus 28-300mm lens in a small camera cube, and my iPad Pro for making notes. There was plenty of room left, so I could easily shrink the backpack to 30L. From the railway station I walked to the place where the river Vecht meets the Stadsbuitengracht, which is near the Weerdsluis (a water lock). It was late afternoon when I arrived at the Nieuwekade. 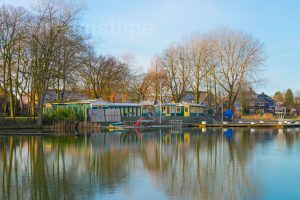 I noticed the soft sun shining on the white houses on the Weerdsingel Westzijde, so I immediately walked to the Bemuurde Weerd Oostzijde, where I could step down to the water level to also capture the reflection of the houses in the water. At the top of the post the resulting picture. Notice the balance between the first tree and the white house at the corner. It still required some processing because the houses on the right were a bit too dark compared to the white houses hit directly by the sun. From there I walked to the Begijnekade via Van Asch van Wijckskade to take the picture below. And from there to the continuation of the Begijnekade, crossing a small parking lot to get closer to the water, where you can see the continuation of the Stadsbuitensingel. These pictures also need to extra processing. The sunlight was already soft, however, I added some extra warmth in it. After this walk and taking so many nice pictures I will never forget this part of Utrecht. After that, back to the hotel to prepare for next-day’s meeting. 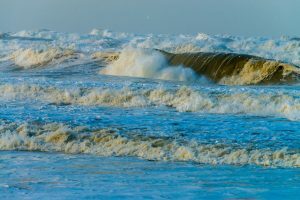 I really enjoyed the walk, taking the pictures, processing them, and getting them accepted by Dreamstime. 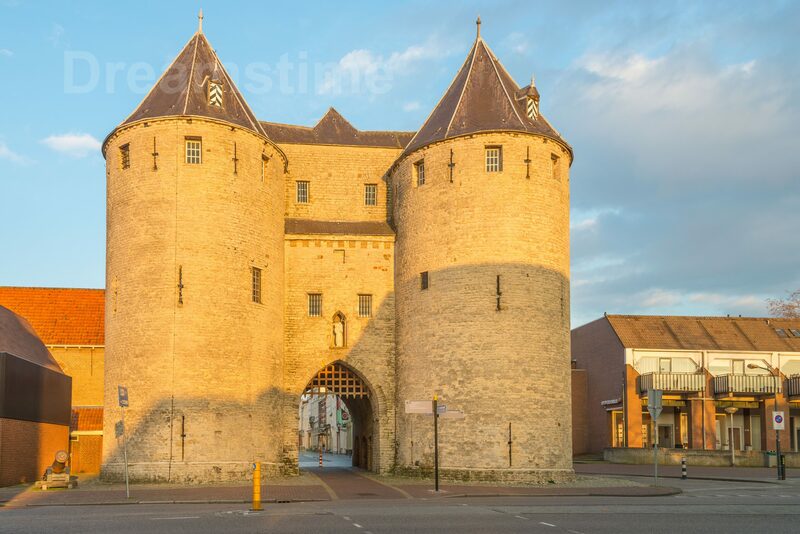 Although we have lived for more than 30 years in Twente we never visited the center of Almelo, besides of course the theater. 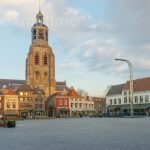 Recently we shared our lack of interest in the city Almelo with friends, and realized that we actually never visited the center of Almelo (besides the theater of course). Pure coincidental, the next day it was a perfect day for a city tour, so we decided to go to Almelo. 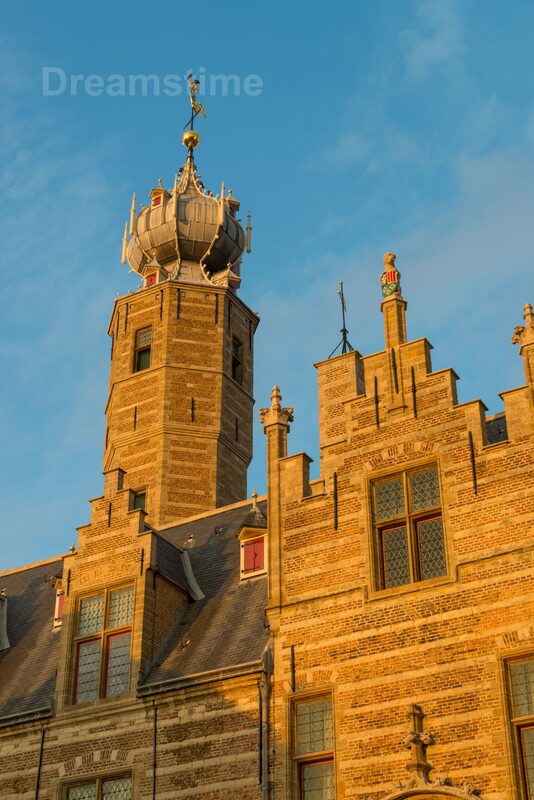 Using the app WandeleninOverijssel we took the cultural heritage tour and walked from the railway station to the City Hall of Almelo, the Court of Justice, and the harbour. Mainly modern buildings. A bluish area, a lot of blue buildings. From there to the city center, which is really a cultural heritage area. Some of the buildings date back more than 3 centuries. And there is quite a variety: huge churches, tiny houses, and extravagant houses. 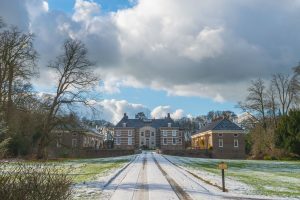 Very special is Huize Almelo, which is a Havezathe. It is still inhabited. 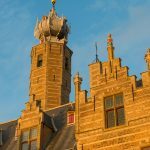 It was a quite enjoyable walk through the history of Almelo, resulting in a very positive image of Almelo. Although we realised that quite a few shops were vacant. We will definitely return. On Komoot I share our route and the pictures I took with both my iPhone X and my full frame camera. 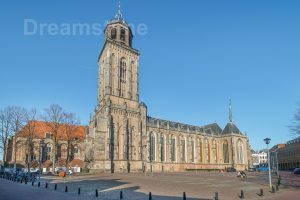 Here you can see all the pictures of Almelo accepted by Dreamstime. All pictures were taken with a 16-35mm lens. Below you see the route we took. Halfway we stopped at De Zoete Bezigheid to have coffee and something special. A nice place to visit! For business reasons I had to go to a meeting early in the morning in The Hague. So, I decided to go the day before. As it turned out, a heavy western storm was expected for that day. A reason the more to leave for Scheveningen earlier than originally planned. 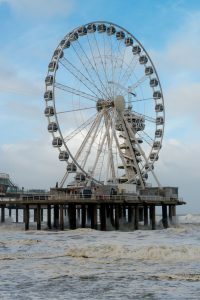 When I arrived at the boulevard in Scheveningen near the pier, I realized how strong the storm was (8+ Bft). There were just a few people on the beach and I could not see any boats. 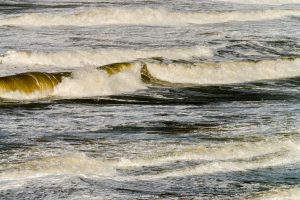 The waves were impressive for Dutch standards. 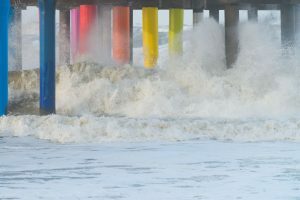 First I took some shots of the pier, with the waves splashing against the supporting pillars. It turns out that there was a lot of foam, so in seconds my camera and my lens were covered with the remains of foam. So, I decided to go to the upperdeck of the pier. Looking at my pictures I noticed a couple of things. 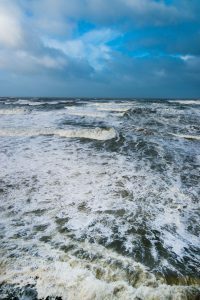 The power of the sea, the wind pushing me away all the time, the sounds was lacking in my pictures. Therefore, I made a couple of videos with my iPhone. Below you see one of them. They look much better, however, it still looks like a storm in a glass of water, in a confined, shallow frame. Also, zooming in both with the camera and the iPhone compresses the whole scene, making it very shallow. So, it does not give the feeling of being part of it. To experiment, I went to the front of the pier to take a picture where the water below me and the horizon were sharp (wide angle and large depth-of-field). Here it was really stormy and the wind was really unpredictable, my camera was shaking in all directions (fast shutter speed). Because of all this I chose for zoomlens at 28mm, aperture f/9, shutter speed 1/640sec, and ISO 320. It gives you a better feeling of being part of it. At home, I was a bit disappointed in the raw pictures: too white, no contrast, and too flat. So, I did quite a bit of processing: added a bit of light, added a lot of contrast, lowered the highlights a bit, added a lot of black, and added some blue, and sharpened the image. You can see the result in the one above. Being back from Andalusía, having processed all my pictures (750+), having 100+ pictures accepted at Dreamstime, and having already 4 sales, it is time to reflect on the trip and on the decisions I took about what to take with me. First of all, it was a wonderful trip, for several reasons: it was the first major trip with my wife after my retirement, it was slightly off season (so, reasonable temperatures), plenty of time to visit various tourist attractions, and last but not least the mystic mixture of Christianity and Islam expressed in the architecture, the food, and the way of living. Secondly, my wife had made this trip before, so she had already made up her mind which attractions to visit to take pictures. It made life much easier for me. Nikon D800 and iPhone I was pretty happy that next to the D800 I had taken my iPhone X. It was nice to put some pictures immediately, without extensive processing, on for example Instagram. Also, in the caves near Nerja the iPhone X did much better than the D800 by automatically taking several pictures at once and combining them into one perfectly exposed picture. Nikon 28-300 mm lens and Nikon 16-35 mm lens The combination of the two lenses was perfect, I used both of them intensively. Small tripod In Sevilla, Cordoba, and Granada I used the small tripod to take pictures in the evening. 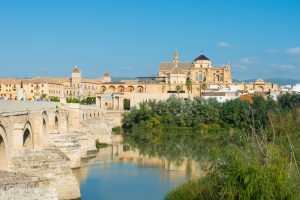 The pictures on Plaza de España in Sevilla and the Roman Bridge together with Mezquita (see below) look very good. The ones of Alhambra in Granada show a slight tremble. This may have been caused by the crowd surrounding me at Mirador San Nicolás or by the long exposures (10 seconds). On my next trip I will definitely take my small tripod with me. Colorspace UDMA 2 The external storage to off load the pictures from the storage cards in my camera was very helpful. It remains on my packing list for longer trips. Peak Design Capture I carried the D800 on the shoulder strap of my backpack quite often. I could grap the camera quite fast. However, putting it back was slightly more difficult. I will certainly continue using it during my hikes. Peak Design Field pouch It is easy to carry smaller stuff like a polaroid filter in my backpack. Peak Design Range pouch On the website of Alhambra it mentioned that we were not allowed to take large backpack into Nasrid Palace. So, I decided not take my backpack and only take my general-purpose zoom lens. So, I used the Range pouch for carrying a water bottle. Peak Design straps During our visit to the Nasrid Palace I used the straps to carry my camera. Arsenal I got frustrated with Arsenal, the smart camera assistant. I was going to use it for the night shots at Plaza de España. When I turned it on I was confronted with a firmware update in a 3G environment and I could not skip it. So, I put it back in my backpack again. Next time it stays home. Peak Design Everyday Backpack 20L I am very pleased with my Peak Design Everyday Backpack 20L. I used it every day. It wears very comfortably and gives easy access to all the equipment. The shoulder straps are fixed to the backpack in a rotating way. Because I am not broadly shouldered the straps tend to fall off my shoulders. Therefore, I always used the sternum strap to hold the shoulder straps tight. Also, if the backpack is fully loaded it tends to tilt. Therefore, I recommend to use the waist straps as well. I am also happy with the 20L version. For a bigger load I use the 45L Travel Backpack. Here are all the pictures of Andalusía accepted by Dreamstime. 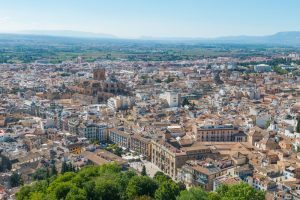 After Cordoba our next stop during our trip through Andalusia was Granada. Our hotel was in Albaycin, known as the Muslim quarter, and just as Alhambra on the list of World Heritage of UNESCO. It still has its original narrow and winding streets going all the way up to the top of San Nicolas. The taxi that took us to our hotel barely fitted the narrow streets. 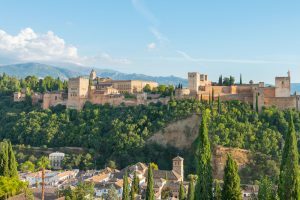 The first thing we did was walk down to the Rio Darro passing through Albaycin to enjoy the view of the magnificent Alhambra. 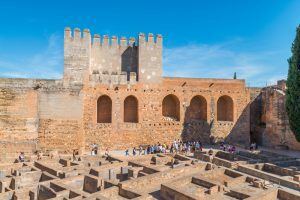 It is really impressive to see the Nasrid Palace, the Palace of Charles V, and Alcazaba, the fortress of Alhambra, being the oldest part of Alhambra. Get your tickets via Internet as soon as possible. If you try to arrange it on the spot, it may happen that only awkward times are available. Our timeslot was a couple of days ahead at the end of the day. So, we first visited the Museum of Sacromonte Caves. 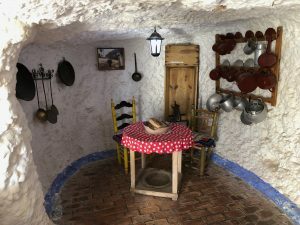 It exhibits the way people lived in caves and also discusses the link with flamenco. 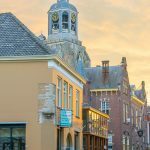 Here are some pictures of Albaycin we took during our strolls through the narrow, winding streets going from one church to the next mirador. 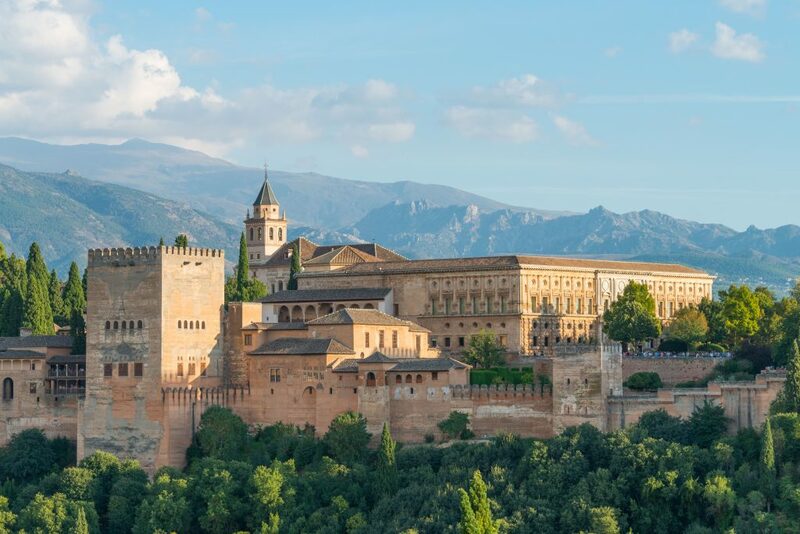 Our next visit was the part of Alhambra for which no tickets are needed, for example the Palace of Charles V. It is a very dominant, square building which stands right in front of the entrance of the Nasrid Palace. On the outside it looks like a solid cubic building filled with a lot of rooms. To our surprise the middle is a huge open circular space. One evening I tried to take a nightspot of Alhambra. So, we went to Mirador San Nicolas. I was not the only one. Even using the tripod was not enough. The exposure times were long and there were a lot of people walking around me. The picture taken was my iPhone X came out slightly better. The next day we visited Generalife, Alcazaba, and Nasrid Palace. 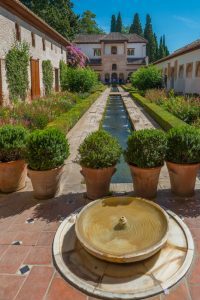 Generalife is a kind of summer palace with beautiful gardens, patios, terraces, and fountains. A real joy to just walk around and enjoy the beauty. The Alcazaba forms the oldest part of Alhambra and is a two-towered fortress. It was used to defend the region. Standing in line to visit the Nasrid Palace, I realised that we were about to enter something special. So many people, specific time slots for entering, and very strict guardians, especially regarding backpacks. 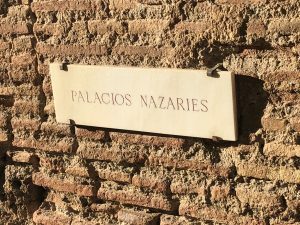 Although you get the feeling that you are entering the palace from the rear door, you immediately get overwhelmed by the beauty of the walls, the ceilings, the patios, the Lion fountain. Everywhere you look you see impressive art work showing a very high level of knowledge of science and technology. The beauty really overwhelms you. Here are some really beautiful pictures of the Nasrid Palace. The last attraction in Granada we visited was the Cathedral. Below a view of the Cathedral and the city from Alcazaba. It is an impressive cathedral with huge pillars and beautiful ceilings. In the pictures I mainly concentrated on the lines of the pillars and the curves of the ceiling. Granada — staying in Albayzin, visiting Alhambra, strolling around in the city — really overwhelmed us. It is definitely a place to visit over and over again. Here are all the pictures of Alhambra accepted by Dreamstime at Flickr. After Sevilla our next stop during our trip through Andalusia was Cordoba. Our apartment was right across the river Guadalquivir close by Mezquita. So, everyday we crossed the Roman Bridge and enjoyed live music almost all hours of the day. The winding streets in the quarter behind the Mezquita are nice to wander around, do some touristic shopping, having a delicious lunch, ending up in tea houses, like Salon de Té, or having an excellent diner at Gourmet Iberico. 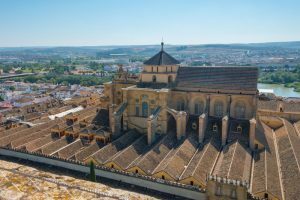 Of course, the Mezquita is one of the most important tourist attractions in Cordoba. We had arranged a guided tour to know more about the history of the Mezquita. It is fascinating to see the co-existence of an Islamic mosque and a Roman Catholic church: there is actually a large cathedral in the middle of the mosque. Inside it is already impressive, however, seeing it from the top of the bell tower makes you realize the sheer size of it. 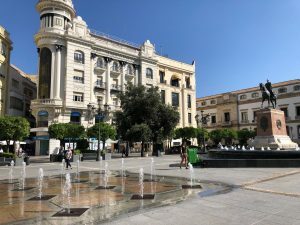 One day we went beyond the winding streets and walked to Plaza de las Tendillas, a nice square with fountains and a statue of El Gran Capitan. From there we walked to Palacio de Viana, a nice palace with many courtyards. Here are the pictures that were taken on the way. Talking about courtyards, we also took a tour along a number of private patios. Of course, in September it is not as colorful as in June, however, it was nice to listen to the proud owners of these patios explaining all kinds of details and how they water the plants. Here are some pictures of these patios on Flickr. 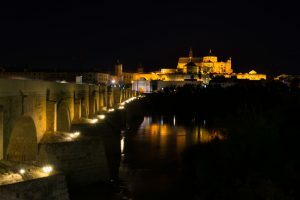 Cordoba, being the last Islamic capital in Spain, really impressed us. We really enjoyed crossing the Roman Bridge everyday and being immersed in the mystique mixture of Islamic and Christian culture. for street photography, panoramic and live pictures, and when I travel light, I use my iPhone X, the pictures are of amazing quality, even when it is dark. Here are all the pictures of the Mezquita accepted by Dreamstime at Flickr.